You also shouldn't time travel again because I'll have to do a violent to someone. Ebony's reasons are the best reasons. Bob: That leaves the question of why *nothing is freaking happening*. We're just standing around talking! Trope-tan: … are you new here? Bob: You. Why aren't you making stuff happen with your oh-so-limitlessly powerful powers? Why is this-as-made-by-you such a pile of nothing? 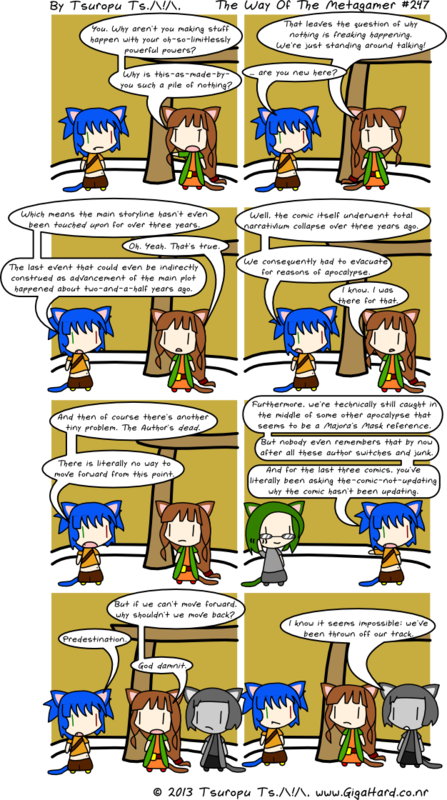 Trope-tan: Well, the comic itself underwent total narrativium collapse over three years ago. We consequently had to evacuate for reasons of apocalypse. Bob: I know. I was there for that. Trope-tan: Which means the main storyline hasn't even been *touched upon* for over three years. Bob: Oh. Yeah. That's true. Trope-tan: The last event that could even be indirectly construed as advancement of the main plot happened about two-and-a-half years ago. Trope-tan: Furthermore, we're technically still caught in the middle of some other apocalypse that seems to be a *Majora's Mask* reference. But nobody even remembers that by now after all these author switches and junk. And for the last three comics, you've literally been asking the-comic-not-updating why the comic hasn't been updating. Trope-tan: And then of course there's another tiny problem. The Author's *dead*. There is literally no way to move forward from this point. Xavius: I know it seems impossible; we've been thrown off our track. Bob: But if we can't move forward, why shouldn't we move back?